Kicking into Kickstarter? Be prepared to kick yourself. A Facebook friend posted a link to this New York Times article. It's a long but entertaining look at a failed* Kickstarter campaign to fund a PID-controlled espresso machine. The article is a cautionary tale about what happens when a good idea is poorly executed, and project backers feel they have been treated unfairly, if not defrauded. Kickstarter is the preeminent crowdfunding website, where people with ideas seek people with money, and, in a perfect world, the combination results in a commercially viable (or emotionally fulfilling) result. Some projects are spectacular successes, some are dismal failures, and most fall somewhere in the middle. I have backed three Kickstarter projects over the years. Who wouldn't want a vinyl stegasaurus? One was a cap for a pen or pencil that turned it into a stylus for use with a touchscreen device, another was a whimsical attempt to laser-cut old vinyl record albums so that they could be assembled into monsters, and the third was a titanium bicycle lock designed to be practically unbreakable as bike thieves rarely carry band saws or water jet cutting machines. All three of these projects brought their products to market; as far as I can tell, the bike lock and stylus cap are both commercial successes (the Monster Records domain name is for sale, so I assume that it, like its models, suffered an extinction-level event). My investment in each of these campaigns was nominal. I pledged $150 to the bike lock campaign, for which I received a lock now selling for $199; a $25 pledge got me a stylus cap. 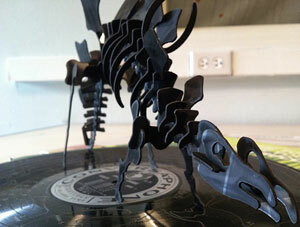 The laser-cut record pledge was a bit more incautious: $120 got me two dinosaurs. And while I use the bike lock, the stylus resides somewhere in a Drawer of Miscellaneous Miscellany (we all have one, right?) and the vinyl dino puzzles are in a bookshelf, partially (OK, mostly) unassembled. As the New York Times article implies, crowdfunding a project carries some inherent risks. You're trusting someone you probably don't know to do what they say they can do, and you have no control over the outcome. You don't have any legal ownership in the process or product, and very little recourse if things go south. From my perspective, it's best to think of these projects as charitable endeavors, minus the tax deductibility of the "donation." If you think the product is innovative and useful, or the idea resonates on an emotional level (a vinyl T-rex made from a classical LP? Awesome! ), then read through the business plan and let its apparent credibility and achievability determine at what level to back it. But, as with any gamble, don't bet more than you're willing or able to lose. As a concept, crowdfunding has much to recommend it. As an investment strategy...well, you might be better off investing in an internet startup with a sock puppet spokesthingy. *This project's Kickstarter page has a somewhat recent update from the creators pledging to keep the project alive. The update is a bit poignant considering it was made before the New York Times report. This page contains a single entry by Eric published on May 1, 2015 2:05 PM. Another Ill-placed Dove Nest was the previous entry in this blog. More Texas wildflower action (with 17% more bugs, too!) is the next entry in this blog.